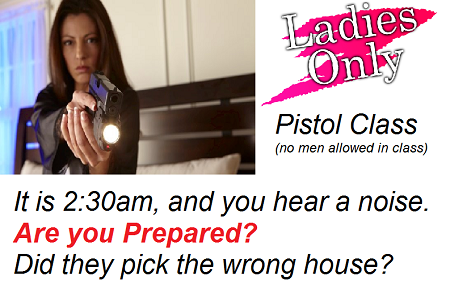 This class is a Ladies only Pistol Class. Sorry Guys, you can't come to this class. This class is geared towards the ladies. This class is 8 hours long. There is classroom instruction and range time in this class. You will be learning how to shoot handguns, rules for safe gun handling, pistol parts and operation, ammunition, shooting fundamentals, two handed shooting position, cleaning the pistol, plus a Q&A at the end of the class. The Q&A will be geared towards self-defense and situations. We will start out shooting, then a 380, then a 9mm, etc. By shooting the different sizes and calibers, we can determine the proper caliber and size of gun for you. If you have a firearm, please bring it with you. We will have guns and ammo for you to use in the class. This is included in the cost of the class. You will need to bring hearing protection and eye protection with you also. We believe that all women should know how to shoot and protect themselves. You can't carry a cop in your purse. It is important that you know how to defend yourself. We can offer a discount if you have a group of ladies that want to take this class together.